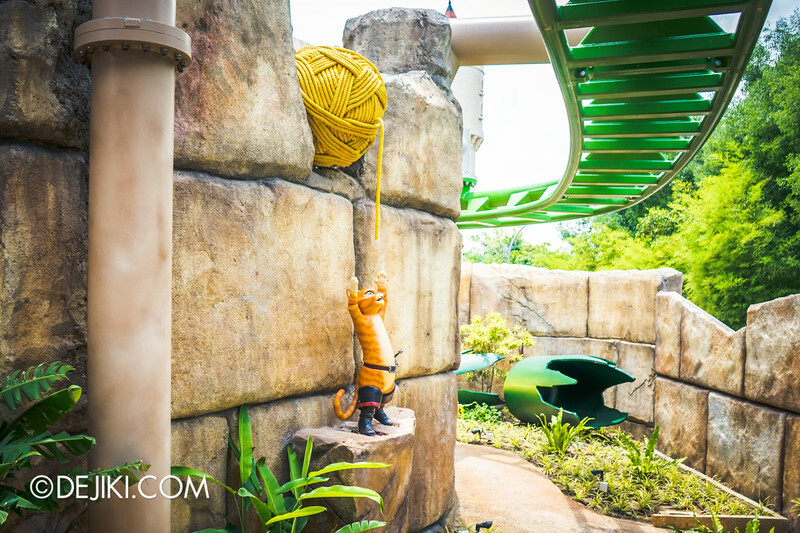 Discover Puss in Boots’ Giant Journey, the newest roller coaster ride at Universal Studios Singapore, in this special feature! 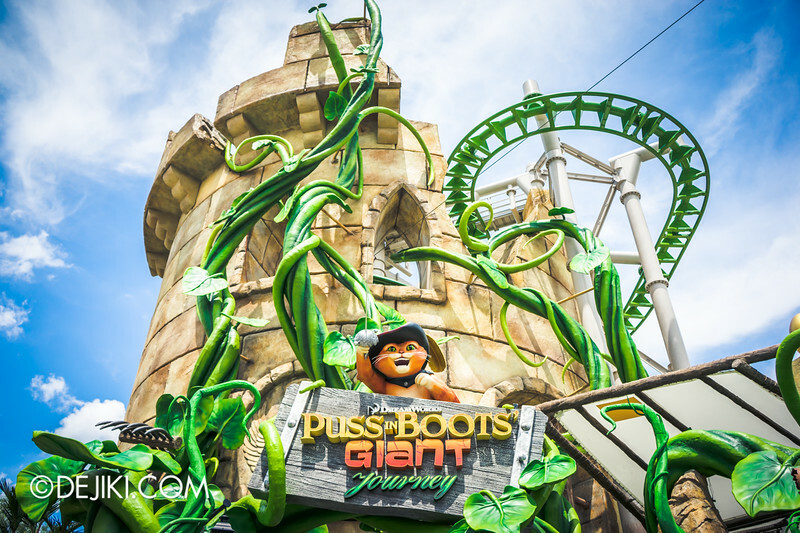 Puss in Boots’ Giant Journey is the world’s first Puss in Boots-themed roller coaster attraction. 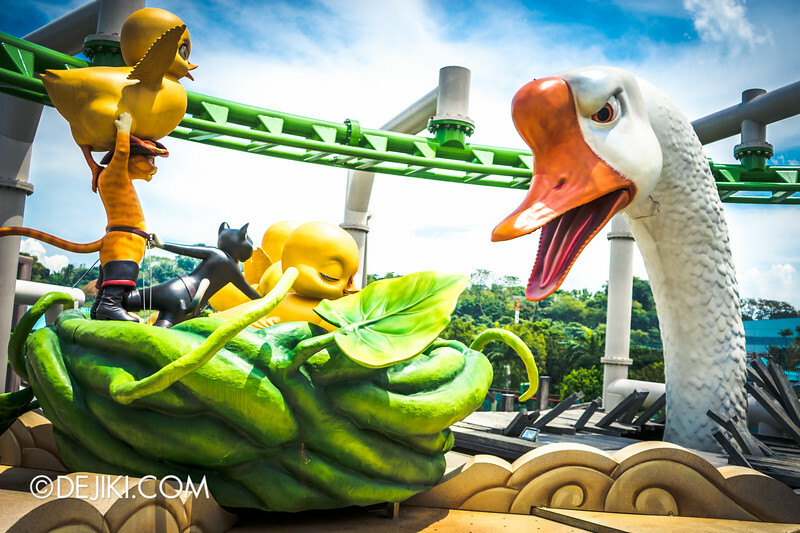 It is also exclusive to Universal Studios Singapore and forms a new extension of the park’s unique Far Far Away zone. 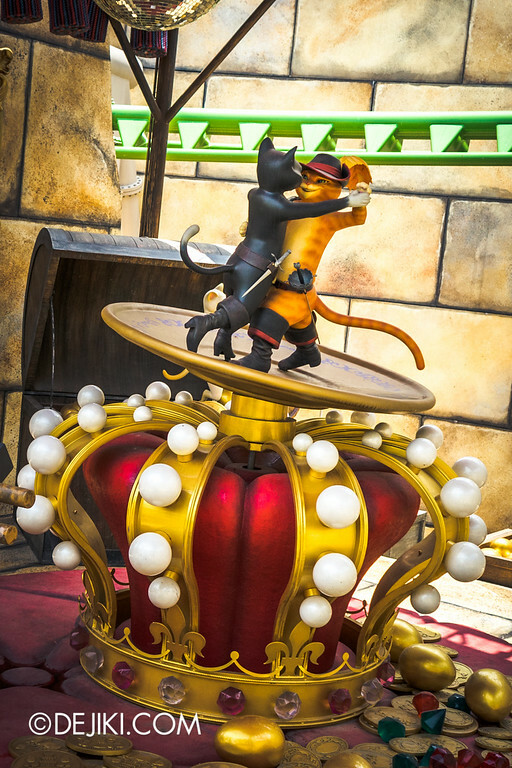 This family-friendly ride occupies the vacant plot of land between the Far Far Away castle and Waterworld theatre, bringing new life to the once-quiet Romeo Drive. 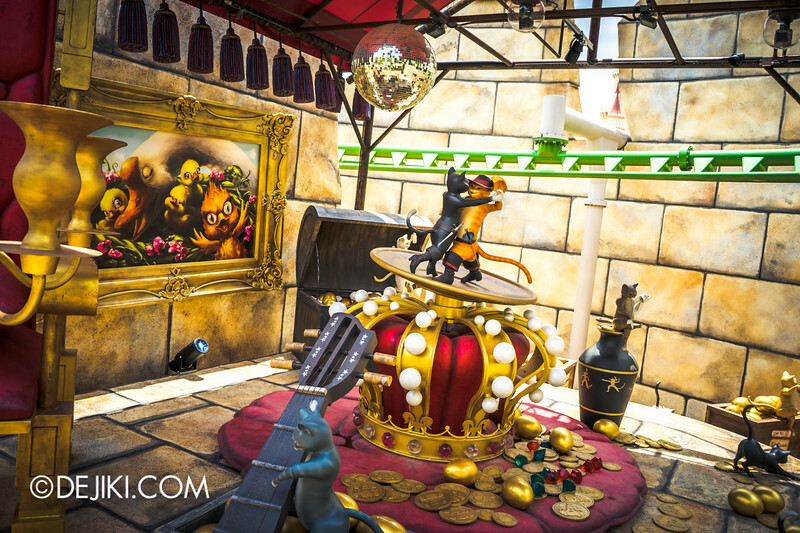 In this special feature, you’ll get to revisit moments from the ride’s grand opening ceremony, tour the beautifully themed areas of the attraction, and read an overview of the park’s newest ride. The park’s newest attraction opened with a special ceremony at Romeo Drive. 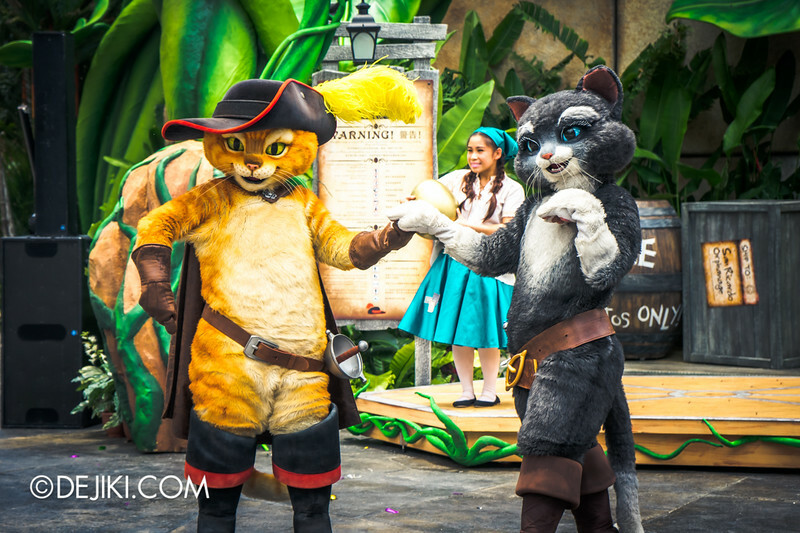 This one-off opening act retells the story of the Orphanage from the Puss in Boots film – with Mama Imelda, Kitty Softpaws, bandits and of course, Puss himself. Due to many requests, this section is now a full entry. View it now! 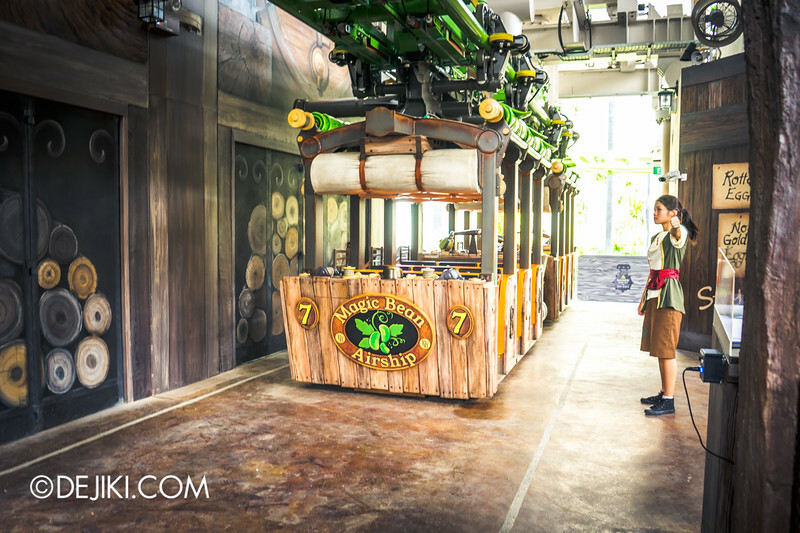 This attraction’s entrance starts from the ride’s beautiful tower. When the line is too long, it can be further extended to the left of the tower and along Romeo Drive (outside the Donkey Live attraction). The line continues outside the Giant’s Castle walls, and finally winds into some sort of workshop. A magic mirror can show you things that were… things that are… and some things that have not yet come to pass. Or it could just be clips from the Puss in Boots film. 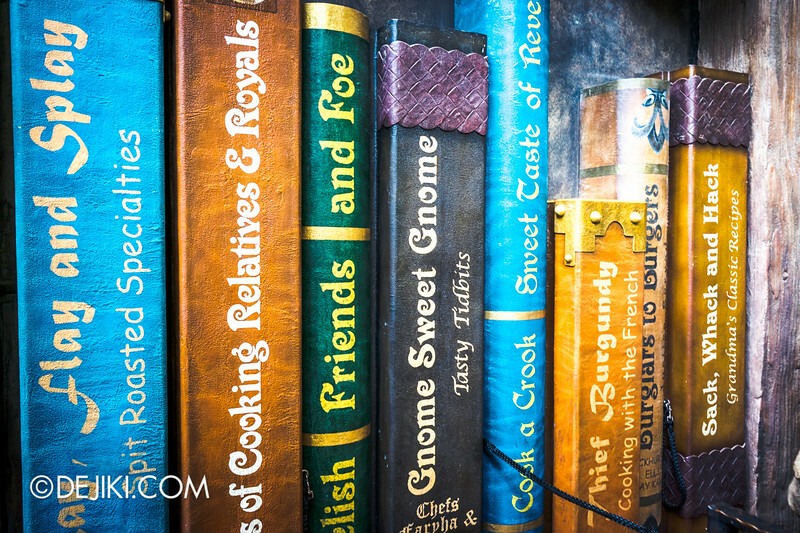 Here, we can see many enormous items – from books to bizarre ingredients. You could get some cooking tips while you wait. The only thing that looks normal-sized are Humpty (Alexander) Dumpty’s prototype drawings of his flying machines. Good to know, because this talented inventor has created the newest model that we’ll use for our adventures in the air! 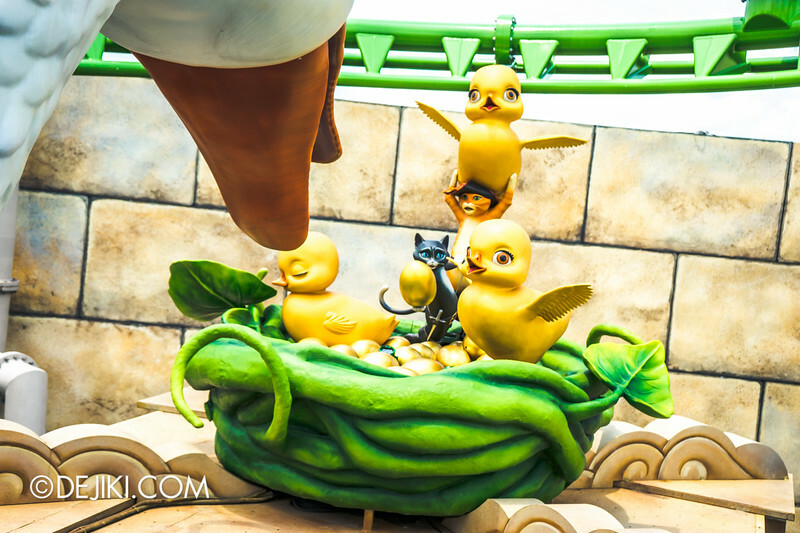 Very soon, you’ll see Humpty’s latest flying machines. 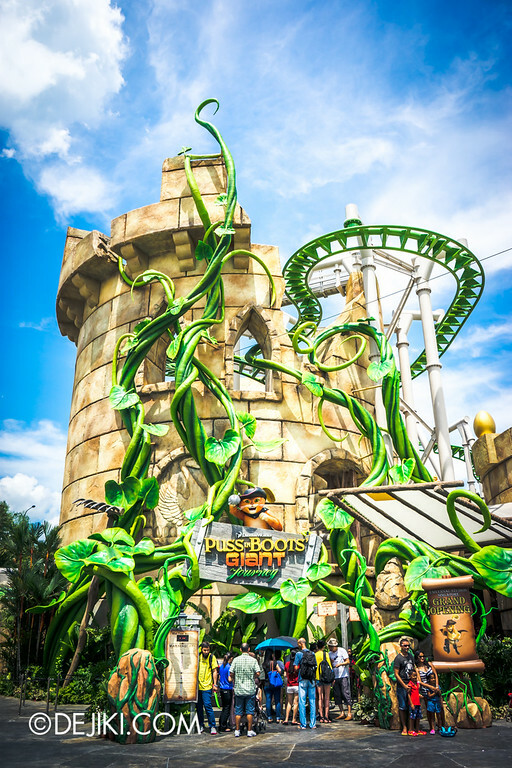 Puss in Boots’ Giant Journey is a glider-style suspended roller coaster ride that includes sudden acceleration, climbing, tilting and sharp drops. The ride is about two minutes long. Height Requirement: Guests must be at least 100cm tall to ride. Children between 100cm and 122cm must be accompanied by a supervising companion. 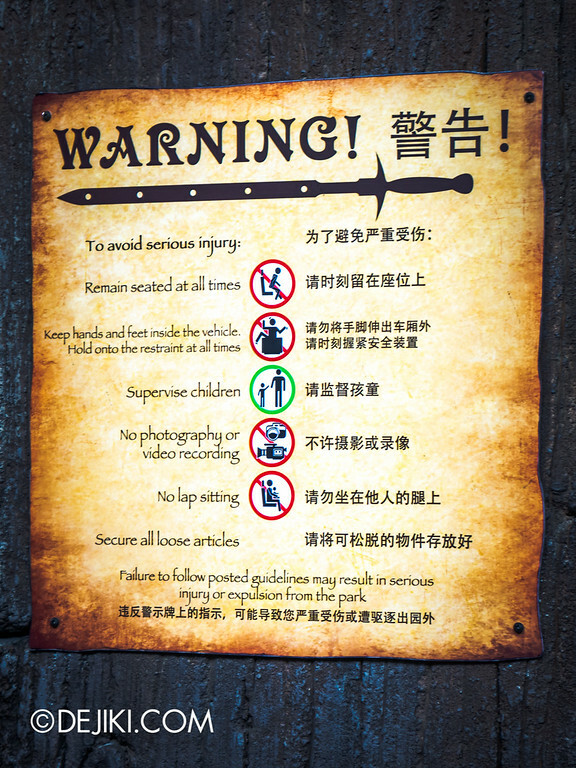 For safety reasons, the park has advised against photography and video recording while on the ride vehicles. 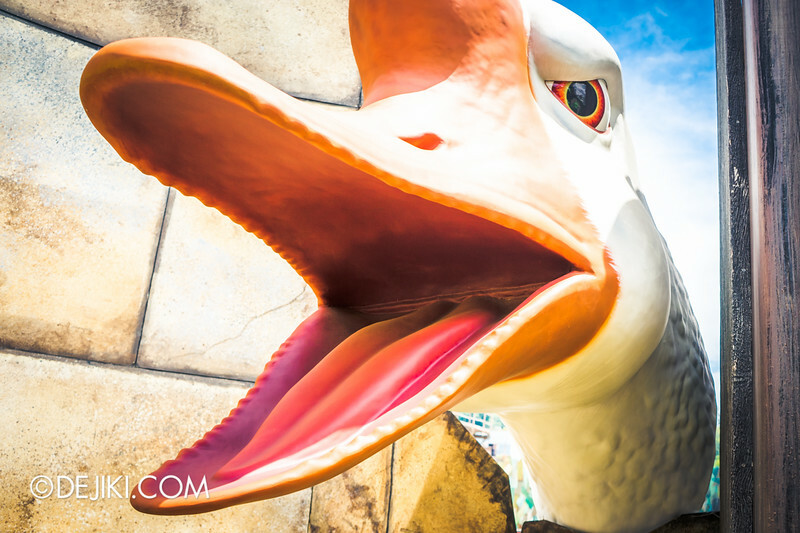 This aerial adventure includes fast drops, sharp turns and a giant goose on the loose – personal items may fall out of the ride vehicles if not secured properly. 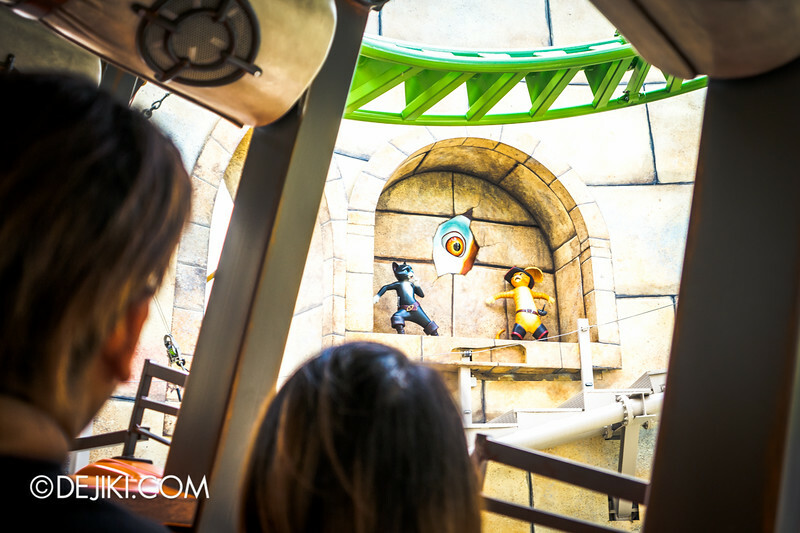 With a spiral lift hill and custom track layout, the ride brings guests through a sky-high adventure through many scenes – in and out of the Giant’s Castle. This suspended roller coaster uses specially designed ride vehicles, of which there are seven unique nameplates based on characters from the Puss in Boots film. Each vehicle seats up to nine guests in three rows, in a traditional sit-down fashion. 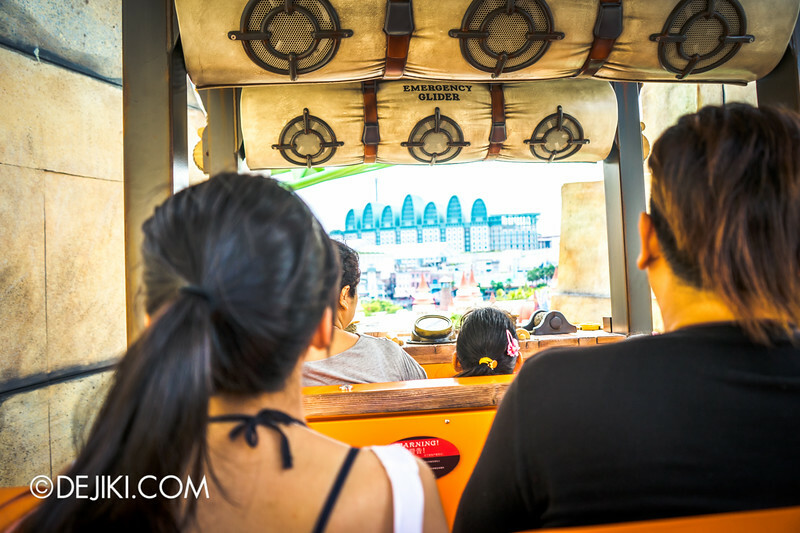 The on-ride audio system provides each guest with a dedicated speaker to hear sound effects along the ride experience. Each seat has its own lap bar. 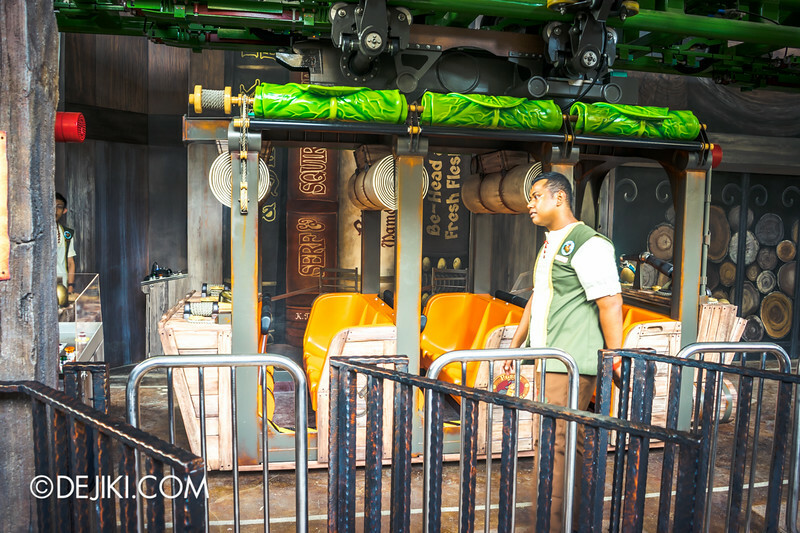 During the ride, guests are instructed to leave all bags and loose items on the floor of the ride vehicle. ROW 1: Generally best row for the view, of course. ROW 1, LEFT-MOST SEAT: Better view of most scenes. ROW 3: Greater g-forces. Highly recommended for all roller coaster fans. 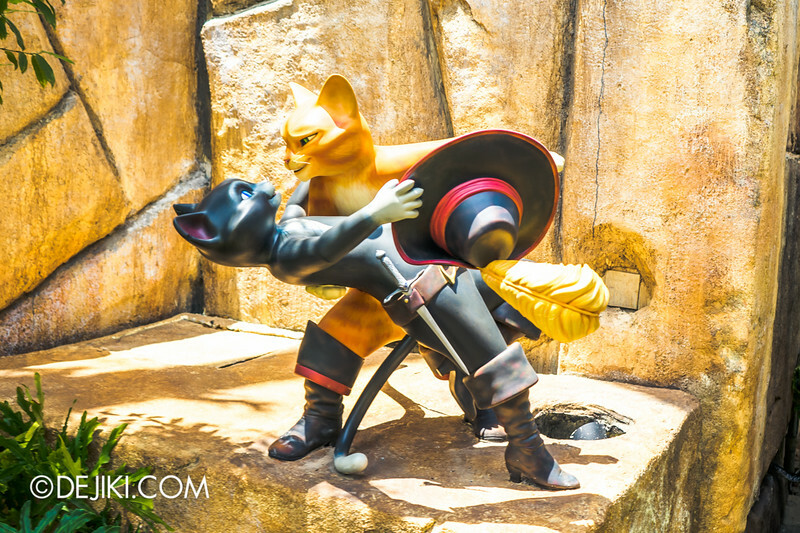 To save the San Ricardo’s Orphanage from closing, Puss in Boots goes into the Giant’s Castle with Kitty Softpaws. Their quest to find the golden eggs runs into trouble when they are spotted by the Great Terror and an unusual gosling. 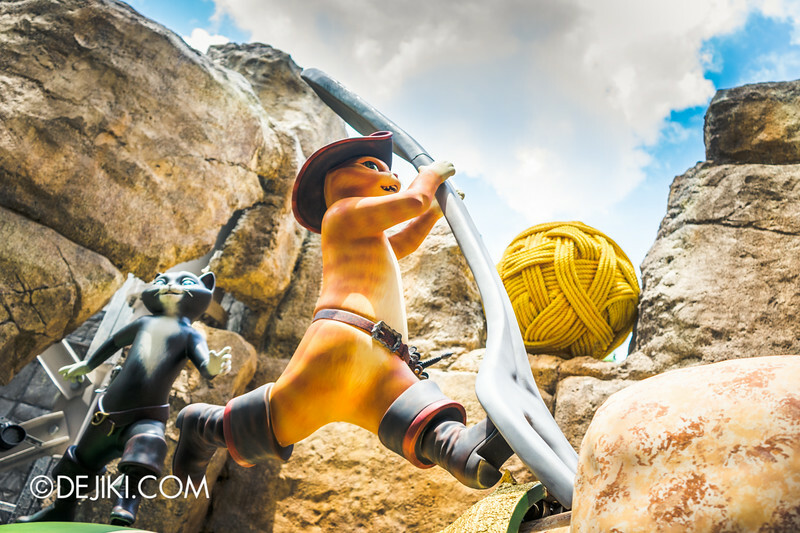 As the airship leaves the loading platform, we quickly spot Puss in Boots getting distracted with a ball of yarn. The airship makes a hairpin turn, and Puss is now helping to launch the flying machine using a giant bottle of champagne. With a loud POP, the airship lifts off and spins out of the tower. 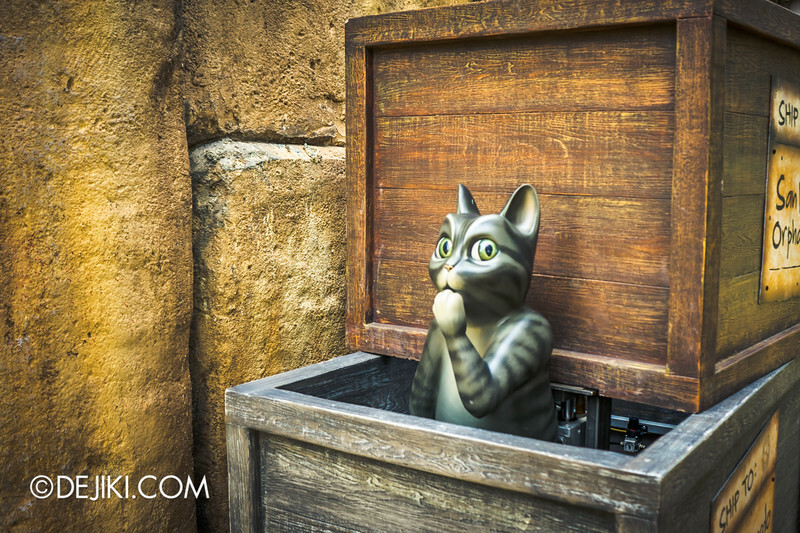 Towards the top, we spot the two cats again – hiding from the Great Terror! 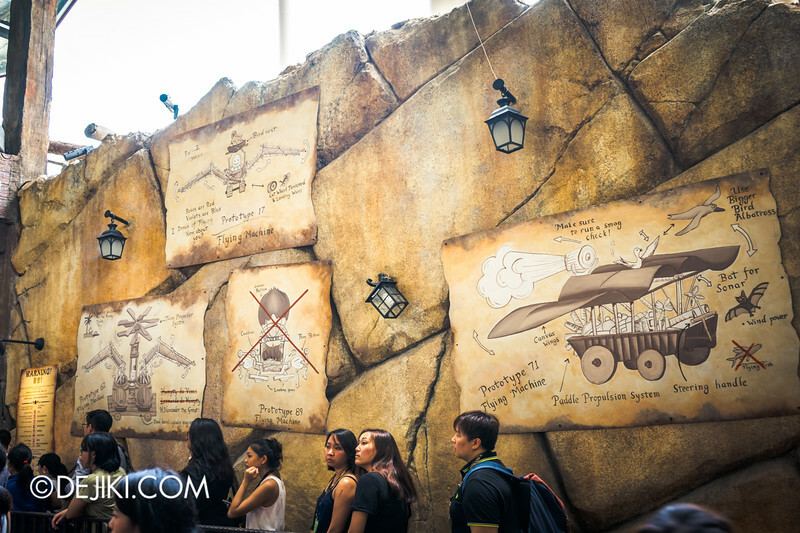 The airship quickly emerges out of the tower, and we get a quick bird’s eye view of Far Far Away zone and other parts of Universal Studios Singapore. But oh no, he has alerted the Great Terror! After a brief respite from the giant goose, the airship takes a swooping dive through the giant’s castle. We drift into an armoury. Tattletale spots us again and quickly summons its mother. Puss dashes in and saves the cute gosling. With funding for the orphanage secured, Puss in Boots dances with Kitty Softpaws. 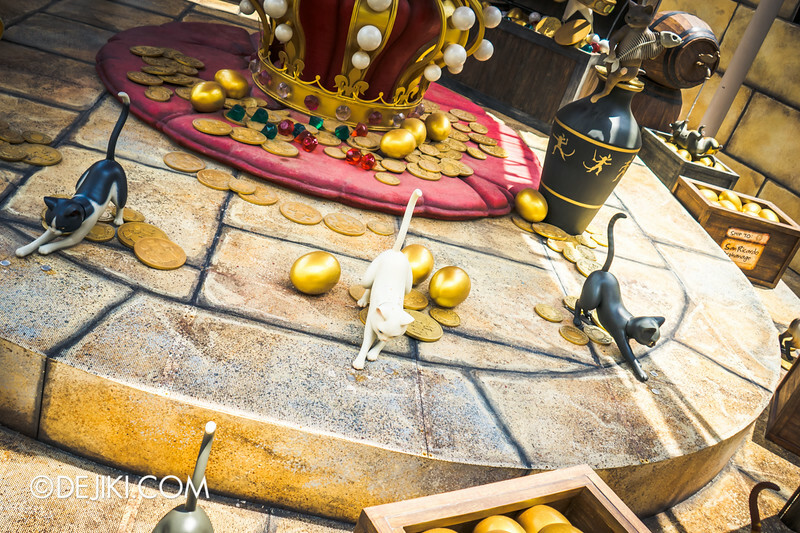 Other cats celebrate together in a tent filled with gold coins and golden eggs – to the tune of Lady Gaga’s Americano. 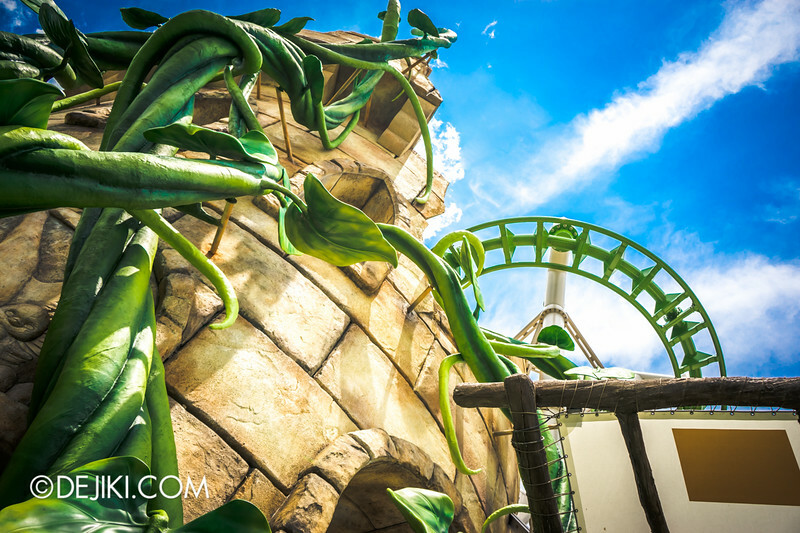 Point of View (POV) Video – 2015 USS NEW roller coaster ride! Watch in 720p or 1080p for a high frame rate viewing experience. The airship makes a short dip and we spot Puss and Kitty again. In short, I enjoyed this new ride. It’s cute and full of fun moments. As a family coaster, Puss in Boots’ Giant Journey has the balance right. The story has wide appeal and of course, this franchise has many popular characters. It is also incredible that a 2-minute roller coaster could be built into this tiny plot of ‘leftover’ land in the park. Designing a ‘family’ ride without being too kiddy is a challenge. Sometimes the content is a challenge and there’s no easy way to go about it. 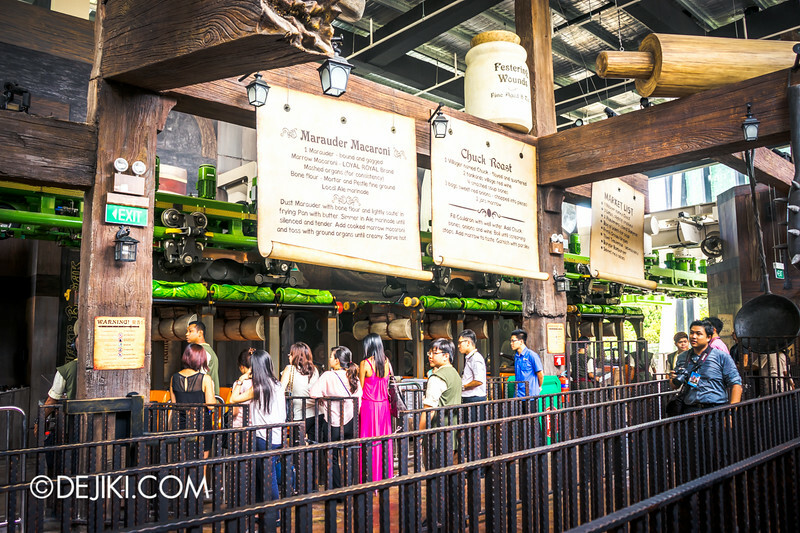 Some theme parks would just build an extraordinary (and very expensive – S$100 million+++) experience around something less thrilling to cater to all ages. Puss in Boots’ Giant Journey is a suspended family coaster. The park already has two suspended rides – Canopy Flyer and Sesame Street Spagheti Space Chase. 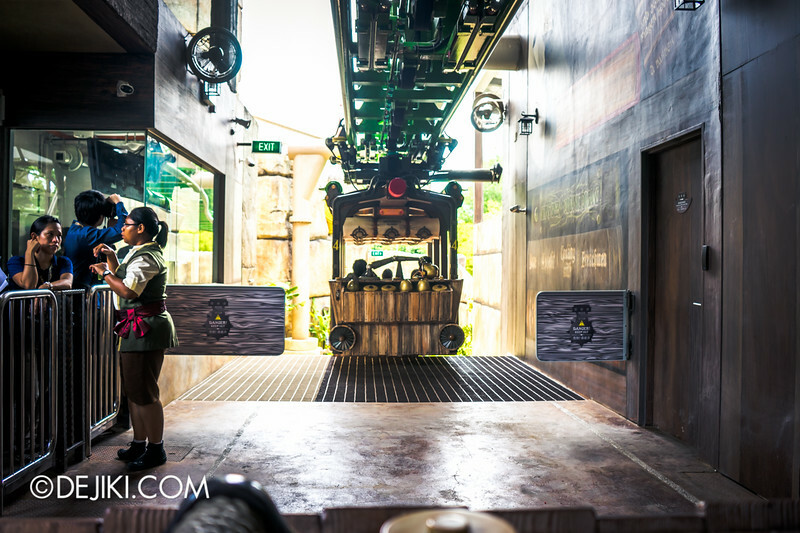 Giant Journey is a bit like both – you get to dangle off the track and sightsee. The ride’s final speed was faster than I expected – something similar to Canopy Flyer, but with a surprisingly swift climb up the spiral lift hill. The drops are not really all gentle, kiddy drops either – you will feel it. It has enough thrills, without being too scary. There are four dips which the park describes as zones with “anti-gravity sensations”. Just as you feel the force – it gently pulls away. So everyone in the family can go on this ride together. And finally, a NEW Universal Studios ride that does not use screens and projection effects. Yes, really. Some park fans have told me that this ride has many brake sections which disrupts the flow. I agree, because the ride vehicle does not just run continuously throughout (like Battlestar Galactica). But there are reasons for the ride to be designed like this – for safety and capacity. 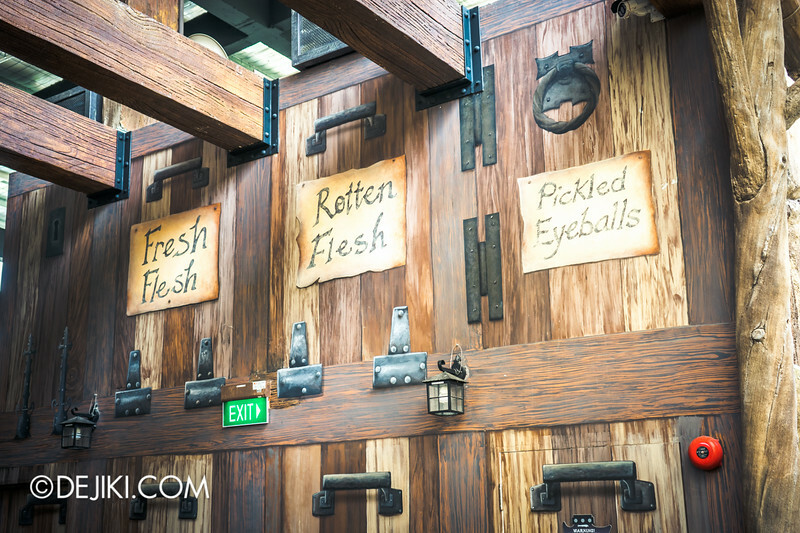 There are rough edges, of course – Some props and sets being incomplete or castle walls that just ‘end’ abruptly. You might notice things that don’t belong – staircases, backstage areas, electrical things. Yes, this is Universal Studios – and unlike Disney parks there is always a dance between ‘show’ and backstage. 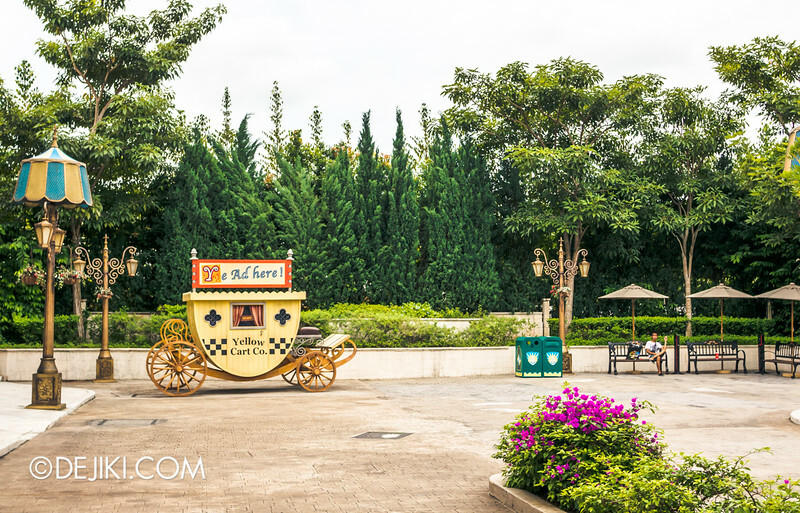 Many of the “animatronic” characters look plastic and almost static – but then again this is an outdoor ride, and the crazy Singapore weather tends to ruin things. 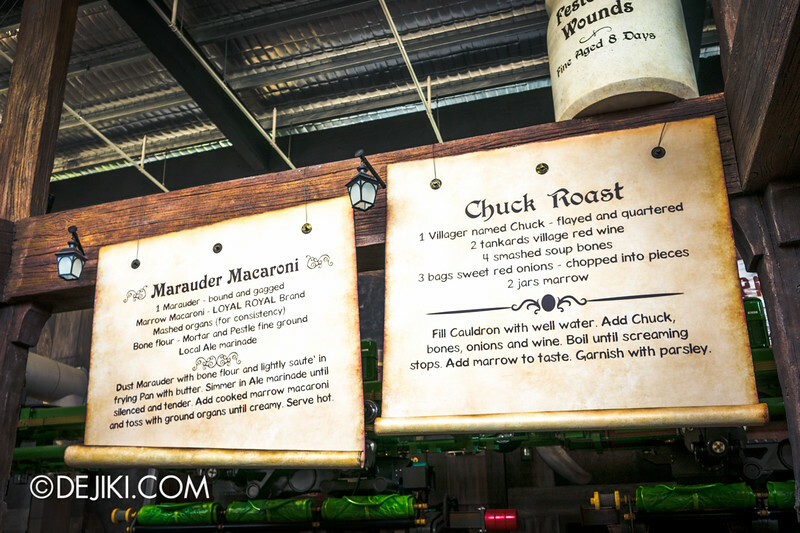 A bigger budget would definitely helped improve the experience – complete sets, complex animatronics. But would guests notice? 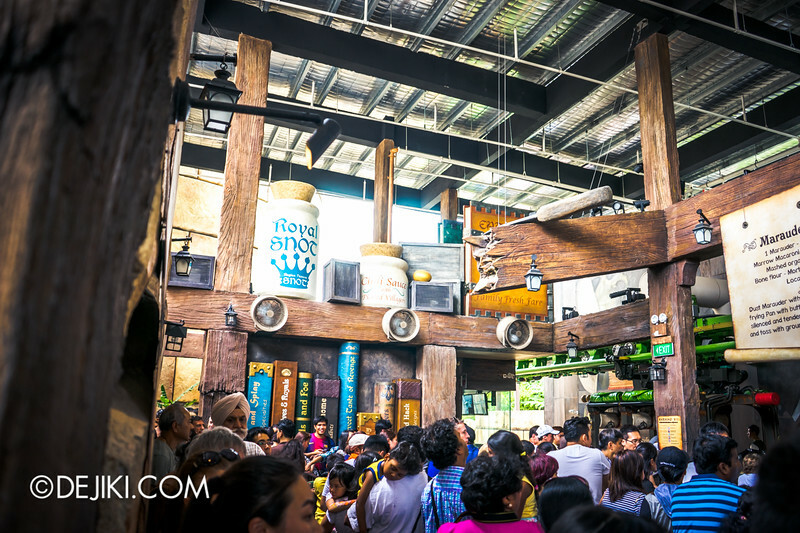 For most outdoor coasters, a flashy signboard and themed queue counts as much as theming they get. 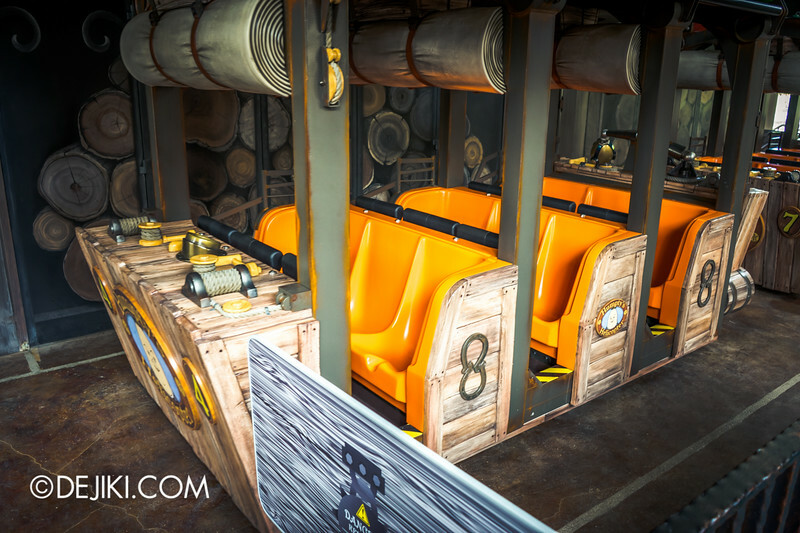 It is very likely that most guests would not notice all of the existing details in the ride as the airship glides quickly through the compact track layout. We’d rather have a ride that is up and running than something that takes 3-5 years to build because of the cost and lofty goals. This ride broke ground in late 2013, you know. 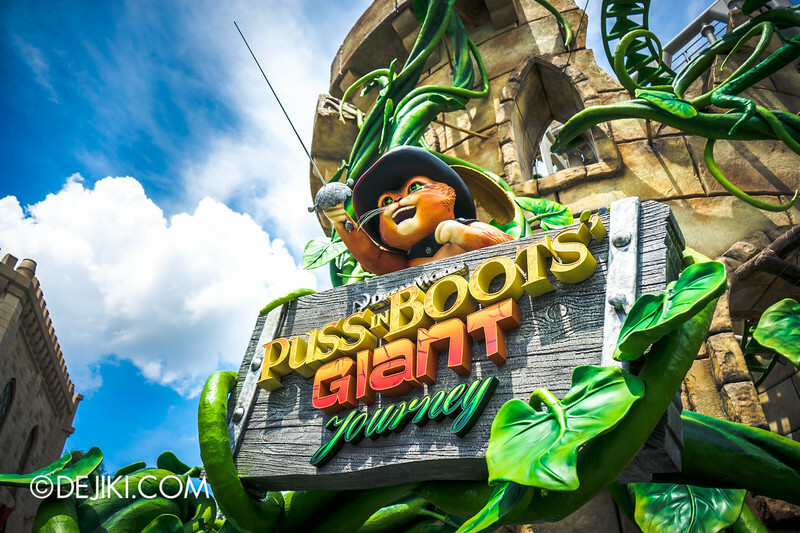 So Puss in Boots’ Giant Journey is definitely memorable and entertaining. 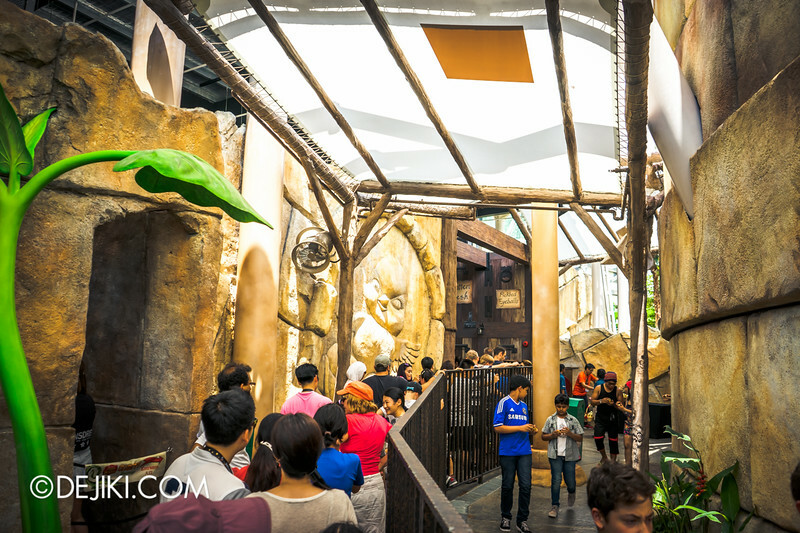 And it’s a exclusive to Universal Studios Singapore. Now if only the weather isn’t so hot! 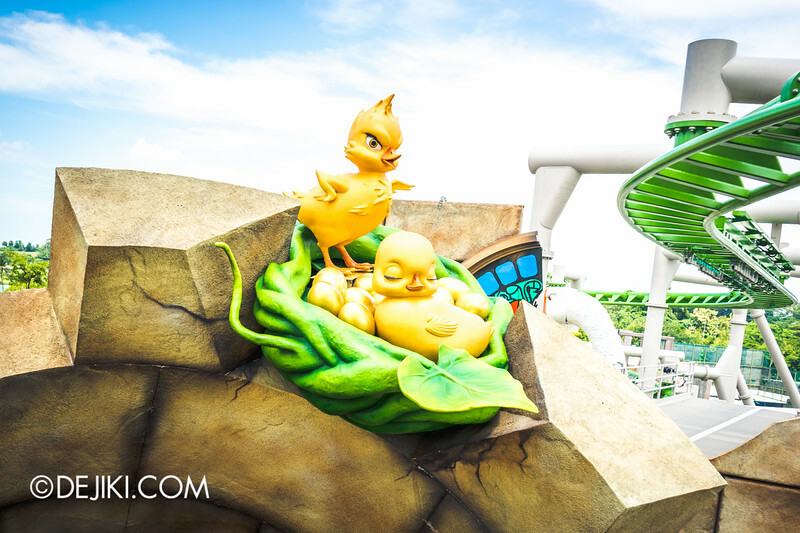 What do you think about this new ride at USS? Let us know your thoughts, reviews and experience in the comments! Missed the opening ceremony? 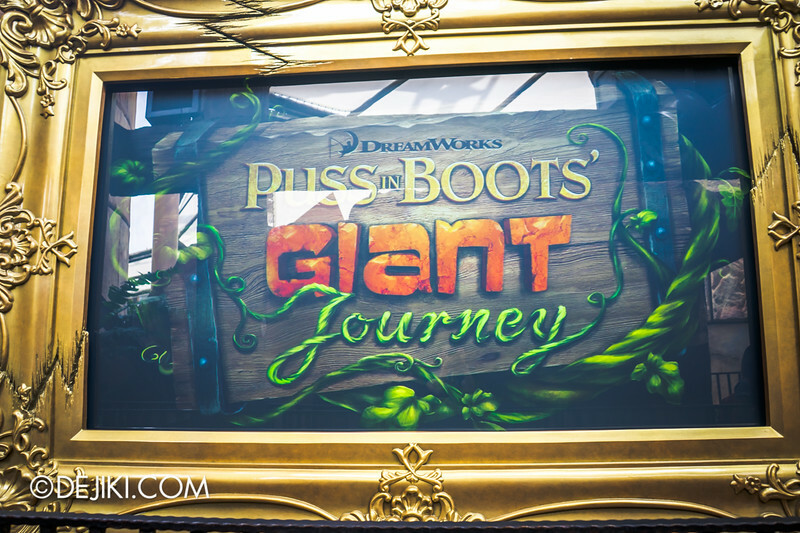 Hop over to the Opening Ceremony of Puss in Boots’ Giant Journey feature now! Looks good. My only qualms are the unthemed ceilings in the ride station. Everything is nicely done till you look up and see the reflective material used to line the roof. Now only if RWS would take up the mettle and give us Diagon Alley. The station building is quite… a surprise given the amount of work gone into the towers surrounding it. I found the roof to be much more distracting, because there is a ‘fallen tower’ that looks more like an arrangement of stones lying on the roof (If you’ve watched the POV video, it’s about a minute in. Otherwise please don’t spoil yourself and see it only when you visit the park). Oh didn’t notice the station ceiling as I took the ride after dark. The scenes look very differrent at night (based on your day time photos. Yet to try the ride in the day). The finale party scene is much more colorful with disco lights n stuff. And the whole ride feels more cooling and thrilling too. I entered the park at 7pm. The ride was under maintenance n only got to ride it at 730. Phew. Agree with you that the speed is much faster than expected! Didn’t expect so much drops & dives too. They managed to hide them well behind the castle walls, with many surprises at each turn. The themeing was really well done too. Right from the entrance to the ride vehicles. I will say this is ride has the nicest themeing in the park so far. Overall it was a very entertaining ride. Quite amazing what they managed to do with a compact land area. Wonder what will the next plan be since there doesn’t seem to have any more empty areas around. Were Invites Membershio holders invited to this event or just bloggers? I am holding a USS Invites Membership and was hoping I could go for the opening ceremony of the event. That being said, the ride looks very promising. 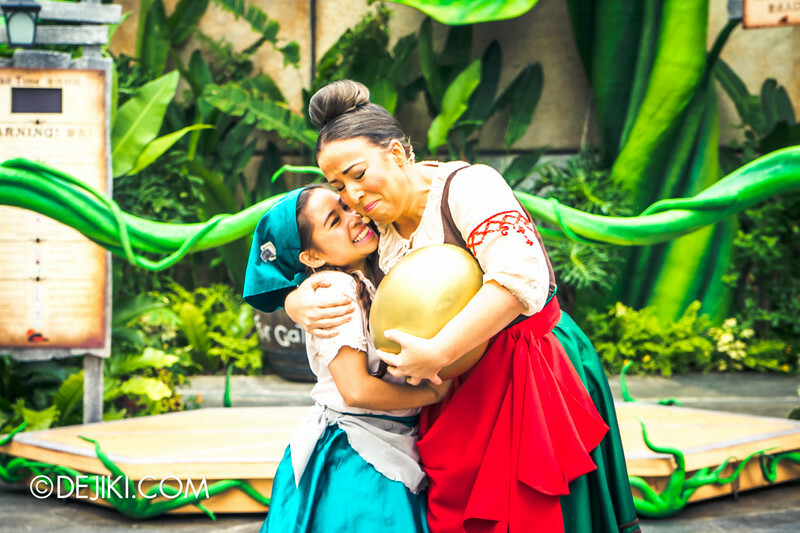 I love that last photo with Imelda. It’s perfect! This opening ceremony event is open to all park guests, although some of us bloggers were able to stand nearer to the action. The park did not publicise this event. Wow, this looks absolutely fantastic. Thanks for sharing!!! As for the brakes on the ride, it looks like they put some show scenes there which doesn’t make it quite so bad. And yay for no screens!! Thanks again for your review and pictures/video. 1. Are carry-on bags allowed on board just like Transformers and Enchanted Airways? If so, how are our items (carry-on bags) being secured on board? 2. Are we supposed to place our carry-on bags onto the shelves provided before riding just like Canopy Flyer? 3. Are we supposed to secure our carry-on bags into the lockers provided just like Revenge of the Mummy and Battlestar Galatica? 1. Carry-on bags are allowed on this ride. 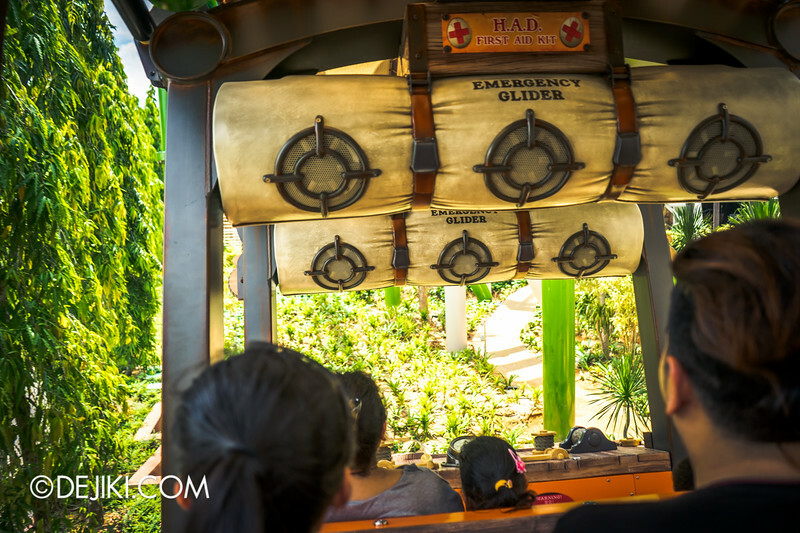 However, guests must exercise due diligence in keeping their belongings secure during the ride, similar to the current carry-on rule at Enchanted Airways. 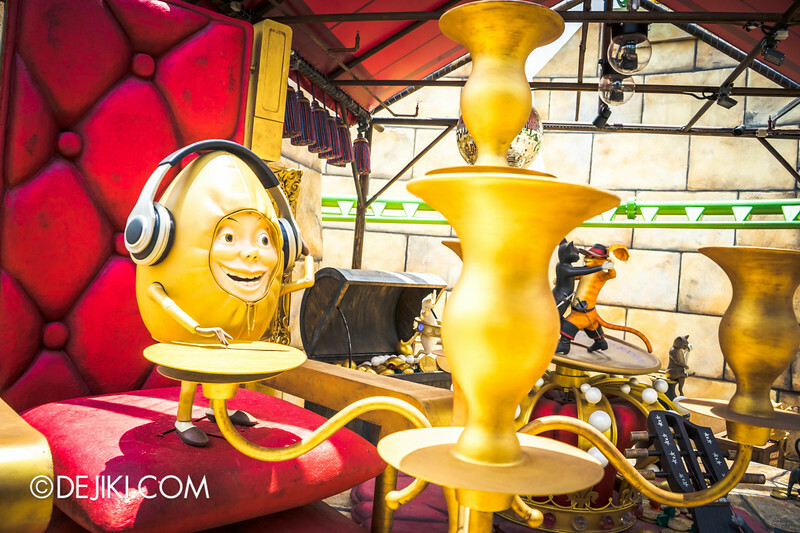 It is best to leave them on the floor of the ride vehicle, tucked in the empty spaces between the feet of riders. 2. There are no shelves provided at Puss in Boots’ Giant Journey. 3. If guests are carrying very bulky items or large bags, they are advised to keep them in the lockers. Unfortunately the nearest free ones are quite far away.